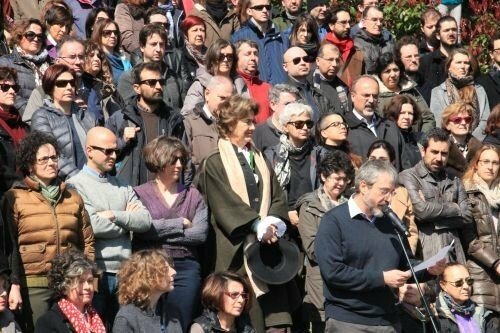 Boğaziçi University academic members have expressed that their colleagues Esra Mungan [image left], Kıvanç Ersoy, Muzaffer Kaya, Meral Camcı and Chris Stephenson have practiced their right to freedom of expression. They demanded release of the academics. Colleagues of Asst. 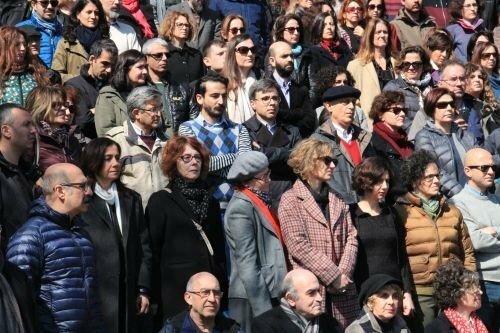 Prof. Esra Mungan arrested along with two of her colleagues for signing “We will not be a party to this crime” were in solidarity at Boğaziçi University where Mungan teaches. 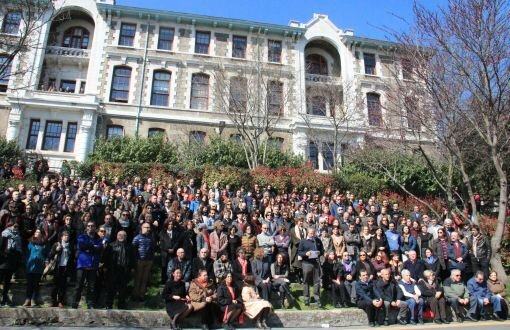 Boğaziçi University academic members in the press statement announced the decision of the Academic General Assembly they held on March 17. The statement held at Güney Kampüs (South Campus) demanded the release of Esra Mungan, Kıvanç Ersoy, and Muzaffer Kaya. “For the first time in its history, an academic member of Boğaziçi University has been arrested. Esra Mungan has been charged with ‘propagandizing for terror organization’. We find this accusation unacceptable. Prison is not where our colleague Esra Mungan should be, it is the university she should be in where she has been lecturing for 15 years. “We as Boğaziçi University have always taken sacredness of human life as basis and opposed all sorts of violence. None of our academic members said things or acted in a way to promote terror, and they never will. “Our university with its students, academic members, and graduates have always stood against any step taken against democracy. Freedom of thought and expression constitutes the main body of this stand”. “There cannot be a university at where there is no freedom of thought and expression. Lectures cannot be given, researches cannot be done, scientific development halts. Climate of violence and terror can be most effectively eliminated in environment of free discussion. “Esra Mungan and our other colleagues, Muzaffer Kaya, Kıvanç Ersoy arrested along with her, Meral Camcı on whom warrant has been issued, and Chris Stephenson departed have practiced their freedom of expression under constitutional guarantee.